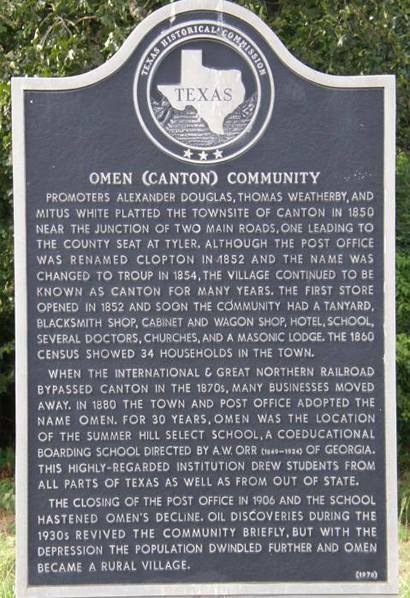 Omen, Texas, AKA Old Canton Texas. Settled in the late 1840s, Omen has gone under many names � including Canton, Old Canton, Round Hill, Clopton, and Troup � all before finally settling on Omen in 1880. In late 1849 the Round Hill post office was opened in the home of Arnold O'Brien, the community�s first resident. In 1851 the new postmaster changed the name to Canton � which caused confusion with the Van Zandt county seat, necessitating the second change to Clopton. After a brief closing, the post office reopened as Troup, Texas. The International-Great Northern railroad arrived in the 1870s, bypassing the town by four miles, forming the new town of Zavalla. The post office joined other residents in moving to the new town, although they retained the name Troup. In the penultimate change of name, Troup�s post office was renamed Old Canton � a name still in popular use by residents. Finally, in 1880, the town settled on Omen. The population was estimated at 550 in 1892 and in 1906 the much-named post office closed it�s doors for good � but leaving the permanent name. By 1912 the town was down to two businesses and in time, the justice of the peace moved to nearby Arp, along with the local Masonic lodge. By 1933 the population was down to 150. Omen�s last store closed in the 1960s and the population continues to be given at the 1933 level. 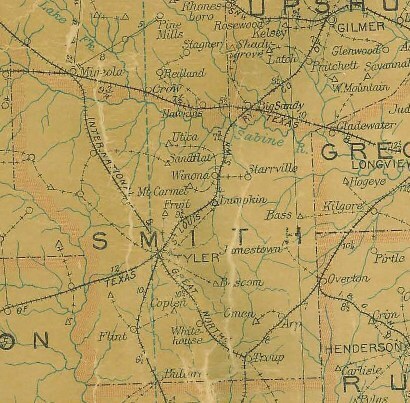 Promoters Alexander Douglas, Thomas Weatherby, and Mitus White platted the townsite of Canton in 1850 near the junction of two main roads, one leading to the county seat at Tyler. Although the post office was renamed Clopton in 1852 and the name was changed to Troup in 1854, the village continued to be known as Canton for many years. The first store opened in 1852 and soon the community had a tanyard, blacksmith shop, cabinet and wagon shop, hotel, school, several doctors, churches, and a Masonic Lodge. The 1860 census showed 34 households in the town. When the International & Great Northern Railroad bypassed Canton in the 1870s, many businesses moved away. In 1880 the town and post office adopted the name Omen. For 30 years, Omen was the location of the Summer Hill Select School, a coeducational boarding school directed by A. W. Orr (1849-1924) of Georgia. This highly-regarded institution drew students from all parts of Texas as well as from out of state. The closing of the post office in 1906 and the school hastened Omen's decline. Oil discoveries during the 1930s revived the community briefly, but with the depression the population dwindled further and Omen became a rural village. 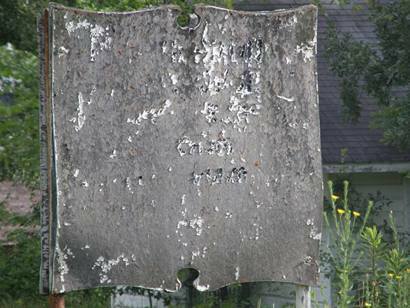 Omen, a small community of about 150 souls, may be the only town in East Texas that once went by an alias. Texas Escapes, in its purpose to preserve historic, endangered and vanishing Texas, asks that anyone wishing to share their local history or vintage/historic photos, please contact us.